Warm up this Winter with a cup of Creamy Espresso Hot Chocolate, made with all natural ingredients like cream, bittersweet chocolate, and instant espresso. 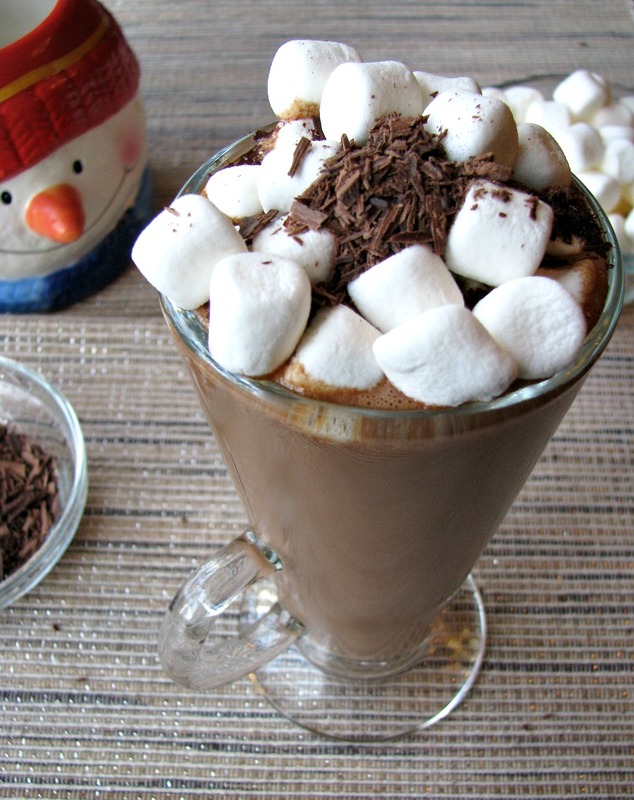 This beverage will warm you up and wake you up! Welcome to Day 6 of Christmas Week. This annual event was started in 2012, and is hosted by Kim of Cravings of a Lunatic. This year we have over 35 bloggers sharing festive sweet recipes for the event. I’m sure everyone drank hot chocolate as a kid, but when you make it as an espresso hot chocolate it becomes such a great grown-up treat! Yeah, there is a big jolt of caffeine in this hot chocolate. Fresh chocolate makes all the difference between this and your typical hot chocolate. It is incredibly thick and creamy. I highly suggest making one after spending time outside on a cold day. 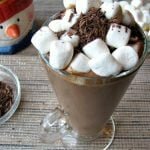 This creamy espresso hot chocolate recipe makes enough for at least two large mugs, but if you want to just have one, the mixture can be refrigerated for up to three days and reheated in the microwave. Read on after the recipe to see all the other great sweet treats shared today. Place the bittersweet chocolate in a plastic freezer place, and smash it with a meat mallet or a heavy pot until the chocolate is fine pieces. In a small pot, combine the heavy cream and water. Place over medium heat and whisk in the instant espresso and hazelnut extract. As soon as it starts to steam, reduce the heat to low and slowly whisk in the bittersweet chocolate, until all the chocolate is melted. 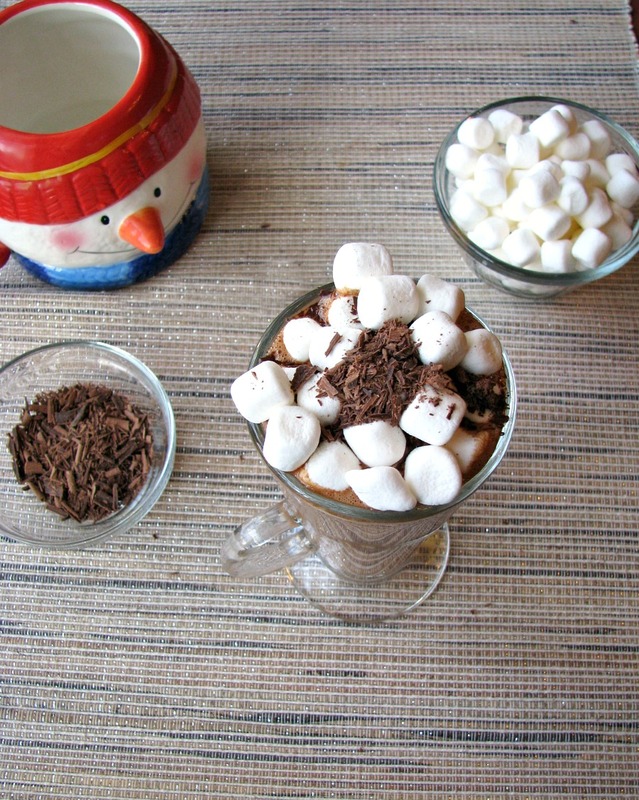 Pour into mugs and top with mini marshmallows and grated chocolate, if desired. Enjoy! my favorite treat to make is christmas cannolis! I haven’t made cannolis’ myself, but I love them! Cookies are my favorite thing, too! We like making homemade eggnog at our home. I have to do that someday. Thanks for stopping by! I just enjoy doing tons of baking for my grandkids and friends. Thank you! I do a lot of holiday cooking and baking. The two things my family require me to make every year are Reese’s Peanut Butter Temptations and Creamy Oat Fudge. I love Reese’s! Thanks for stopping by!! All that’s missing is the foam of a cappuccino, but yes, exactly! Glad you liked it!